Composed by Gustav Holst (1874-1934). Arranged by Robert W. Smith. 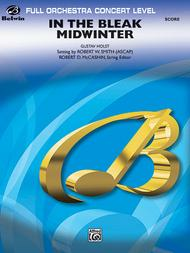 Full Orchestra; Masterworks; Performance Music Ensemble; Single Titles. Belwin Concert Full Orchestra. 20th Century; Christmas; Masterwork Arrangement; Mother's Day; Romantic; Sacred; Spring; Winter. Score. 20 pages. Duration 4:30. Belwin Music #00-BFO9709C. Published by Belwin Music (AP.BFO9709C). Written in honor of the mother of the arranger's wife and her musician children, each solo voice represents the chosen instrument of each individual. Woven together into an astonishingly moving, emotion-filled scoring, this piece uses the many colors, shadings, and dynamic levels of your orchestra very effectively. This is a work of major importance. (4:30).